These outdoor furniture plans are very easy-to-build woodworking projects. They can be built with minimal tools - basically, all of the essential carpentry hand tools, plus a circular saw. The coffee table and end table are also excellent patio or deck ideas. If you are new to carpentry, these woodworking projects are ideal! There aren't any complicated angles to worry about, and they don't require much wood or many screws. I built both of these woodworking projects from scrap material left over from a deck project. Coffee Table Plan - online plans for a simple outdoor coffee table that you can also use indoors! Patio End Table - these plans are very similar to the coffee table plan, but provide an extra shelf below for magazines, etc. 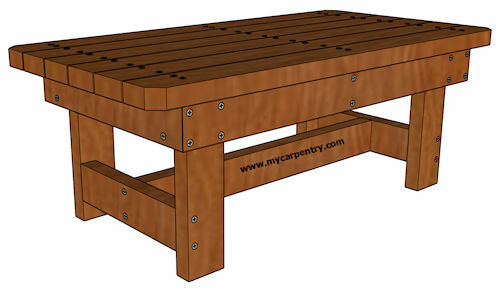 If you are looking for picnic table plans, there are three styles available on mycarpentry.com. 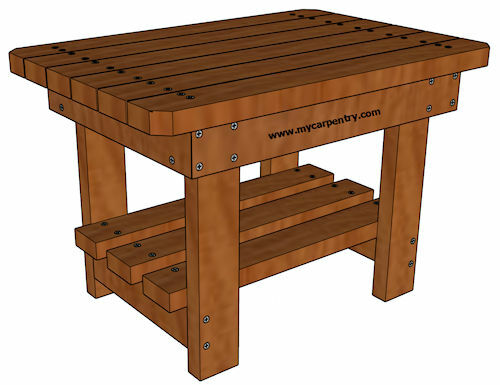 Each plan provides a complete materials list and the step-by-step instructions you will need to build each picnic table. For more information, click the image below. If you haven't already decided which species of wood you are going to use for your outdoor wood project,read this.